Using folded fabric centerpiece patterns, you can create a variety of elegant and whimsical centerpieces for your table. Don't be afraid to try something new and take advantage of the fact that unlike paper, fabric can be folded and refolded without being worse for the wear. Use heavy-duty fabrics, much like the cotton found in durable cloth napkins or dishtowels, work the best. The sturdiness of the cloth when folding the fabric centerpiece is essential for how well it will hold together, how well the creases will stay in place, and how well fabric can be stacked on to other folded fabric elements. Use a square piece of heavy-duty cotton fabric (or a cloth napkin). Fold the fabric into quarters, and position the folded piece so the center is the bottom point of a diamond. Begin folding the fabric one loose piece at a time; starting by folding the first piece so it fits snuggly inside the square, (it will look like a triangle pocket). Repeat this step with each additional flap, except leave a one-inch exposure with each fold. Flip the folded fabric over, and repeat these steps until a pointy-topped ice cream cone is formed. Consider tucking additional pieces of different colored fabric into the folded pieces to give the illusion of different flavored ice cream. Like the ice cream cone, fold a heavy-duty piece of fabric (or cloth napkin) into square quarters and keep all the edges pointing downward. Create a triangle by folding all the edges of the square upward. Fold the triangle's left and right points to its center, and then fold under the points that are still extended. While holding the base created by these folds, begin lifting the center. Continue pulling each of the napkin edges until a bloom begins to form. Be sure to hold the base firmly to ensure the blooms do not slip out of place. Use a variety of colors, as well as a variety of origami paper bird patterns, to continue decorating this centerpiece. In addition to fabric, stemware and a plastic turkey head (found in most craft stores, as well as through online craft supply retailers). Use fall colored or Thanksgiving (or Harvest Festival) themed heavy-duty fabric or cloth napkins. Begin by folding the piece of fabric in half. Continue by turning the folded piece of fabric horizontally, and creating pleats about ½ inch or one inch in width. Holding the pleats together, turn the fabric vertically and fold the bottom upward about two inches. Place the fan into the stemware, and add the turkey head to the front. Folded Fabric Elegance is the perfect resource if your centerpieces are for something fancy like a wedding reception or formal banquet. Folded Flowers features fabric origami that uses silk ribbons. The flowers featured in the book are whimsical in design; perfect for a birthday party or women's luncheon. 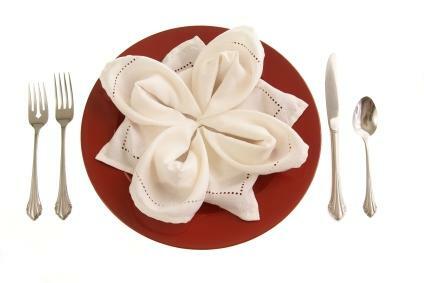 The Simple Art of Napkin Folding offers 94 simple designs. The designs can be used with paper or fabric folded napkins. These are just a few of the many ideas entertainers can explore when setting up the perfect folded fabric centerpiece. Add embellishments like confetti, strings of lights, and bottles of bubbles to further add to the look and feel of the centerpiece. Peruse origami books for additional folding instructions, ideas, and suggestions.